Riding high with the Amazon partnership, Noble Skiodo, the first to introduce Bluetooth in LED TV’s revolutionizes TV viewing experience in India with its high end technology at budgeted prices & also exclusive Technological tie-up with Skiodo Inc. from Silicon Valley, brings in another addition to its growing range of TV Portfolio with the launch of BIG ‘55 inch Full HD Smart TV 55MS55N01LED TV’ a step up model for the festive season, featuring brilliant picture with Full HD LED display paired with high performance engine, high-speed response and smart, multi-function versatility. Designed with a sleek ultra-modern bezel and a high gloss finish, Noble TV adds a contemporary edge to your home décor. Its sleek bezel allows you to perfectly mount the TV on your wall and its full HD display provides an optimized viewing experience with excellent visuals and phenomenal picture quality. With a pixel resolution of 1920×1080 pixels for a sharp and brighter picture combined with a perfect blend of color and contrast you can now enjoy a good quality video without stressing your eyes. Crafted with trusted A+ screens and integrated with high clarity, high contrast and high brightness, its 0 dot screen eliminates unnecessary noise while providing utmost clarity. Its anti-glare panel and dynamic contract ratio of 2,00,000:1 not only gives in-depth color reproduction but brings in full radiant glory. The large sound bass enhances even the smallest of sound bringing it to life. The audio output provides Bass Adjustment feature, Treble Adjustment feature, Sound Equalizer and Power Audio for enhanced audio clarity. Its 12Wx2 sound output provides crisp and sharp audio clarity enabling you to enjoy your favorite music without the need to connect any external speakers. With an in-built amplifier that converts your LED into a rocking music system by simply plugging in the external speakers, you can enjoy highest sounds at the lowest of costs. Screen movies at home with additional features such as surround sound, direct home theatre connectivity and 5x volumes that transform your home into nothing less than a mini theatre. Hassle free connectivity allows Noble users to now connect their smartphones, laptops or any other Bluetooth transmitting device to play songs and videos directly on to their TV screen. Streaming content from your smartphone is as easy as it gets with the MHL feature, allowing you to connect your TV to a smartphone, tablet or other device physically, to let you enjoy your favorite content on the Big screen, it also support multiple audio and video formats like mp4, WMA, AVI, MKV, FLV, WMA offering a complete media viewing experience. Browse all multimedia content stored on your pen drive, smartphone or portable hard drive with the 2X USB ports that supports a range of peripheral devices, for faster and easier content sharing. 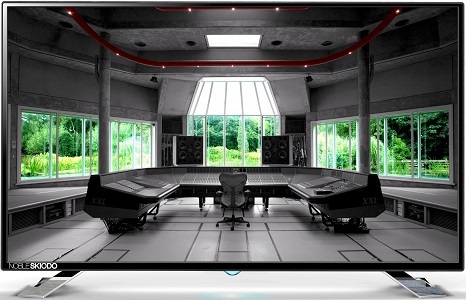 The 2 HDMI inputs allows you to use the TV for varied purposes, for instance you can connect an HD set top box, a Blu-ray player, Game Console, Digital Camcorder or even use the screen as your computer’s monitor. Backed with VGA port connectivity, you can now enjoy all your digital content with full HD screening. Eco-Friendly Technology: Designed to keep the eco system green by providing the best in class sound quality at the lowest of costs. Also an eco-smart feature automatically shuts down the TV if left idle, saving unnecessary power consumption.